Ben Johnson celebrates his 33rd birthday on 5 April. Five months into retirement, premiership Magpie Ben Johnson opens up on some of his experiences from 13 years in the AFL. Ben Johnson has formally handed over his No. 26 jumper to fellow left-footer Marley Williams. 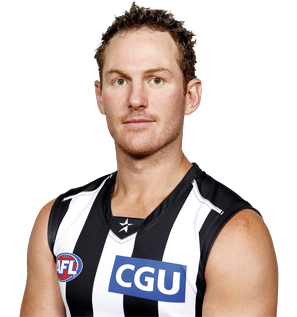 Johnson is the most experienced Collingwood player on the 2012 list, having played 224 matches for the club over 12 seasons. He has been remarkably consistent, playing most of his footy at half back as well as taking turns in the midfield, on the wing and as a tagging back pocket. His long, weaving runs have been a feature of his play, as is his left foot. Johnson's awkward kicking style raised eyebrows in his early years, but over time has proven itself to be more accurate than most. Has long been a leader at the club and has a great record in big matches. Played in all five Grand Finals (and three pre-season Grand Finals) in the Mick Malthouse era, and was standing Stephen Milne in the dying minutes of the drawn Grand Final in 2010. On the veterans list in 2012. Had a forgettable pre-season ahead of 2012 because of a hamstring injury and then it looked as though the veteran defender’s season was shot when he needed a shoulder reconstruction after round six. He fought back to play in the VFL by round 20 and was back in the senior side two weeks later. Played all three finals and fought hard against Hawthorn in the first week of September but his effectiveness was down against Sydney in the Preliminary Final. Has been offered a one-year deal to play on into a 14th season. Started the year in sprightly fashion, belying his status as the second oldest player in the team. Had 33, 23 and 26 disposals in the first three games and was a key factor in the side’s bright start to its premiership defence. Injured his hamstring in round six and didn’t return to the senior side until round 17, having reinjured the muscle when attempting a comeback via the VFL in round nine against Coburg. Hit his straps quickly once named in the seniors, winning 33 touches and kicking two goals against Gold Coast. Was busy throughout the rest of the season and one of his team’s best in the Grand Final loss (26 possessions, one goal). Struck an excellent balance between attack and defence, playing an important role as the linkman at half back but still managing to shut down the most dangerous of opponents. Accrued over 20 disposals in 16 of his 23 matches, and was again one of the best afield on Anzac Day when he picked up two Brownlow votes. Had a standout game against the Western Bulldogs in the qualifying final, winning 31 disposals, and kicked a famous goal to crush Geelong’s spirit when he danced around Cameron Ling and slotted a six-pointer in the preliminary final. Was at the coalface until the very end of the drawn Grand Final, marking Stephen Milne when the Saints goal sneak was centimetres from kicking the match winning goal. His defensive work in the frantic final minutes was heroic, and received plaudits from his teammates and coaches post match. Backed up in the replay with a goal in the opening quarter and an important role in guiding the side to its 15th premiership. He was the only premiership player who had played in Mick Malthouse’s first game as coach 11 years earlier. A strong pre-season meant that he lined up in the senior side in round one and averaged 24 touches in the opening fortnight. Broke his leg in a tackle in round three against Geelong, meaning he was sidelined from the seniors until round 15. Eager to make up for lost time, Johnson returned to his prolific best and by the end of the home and away rounds had begun to find the form that had eluded him for two years. Kicked two crucial goals in the third quarter of the semi final to help propel the Magpies to a famous win over Adelaide. Booted another goal from long range early against Geelong a week later, but his 22 possessions weren’t enough as the Cats marched to a Grand Final. Slotted straight back into the senior side once his suspension ended in round two, and while playing some useful games at times, Johnson’s form was nowhere near his best of 2002-2006. Having averaged only 12.7 disposals in his last four matches, Johnson was dropped after round 17 and played the last five games in the VFL. In 2010, he admitted that he has lost his passion for the game, and was close to giving it away until he was talked into continuing by his coaches. Had a solid if unspectacular season, still sharing his time between the midfield and the forward line. Won 25 possessions on three occasions, and picked up three Brownlow votes along the way. His personal highlights were a near best on ground display against Brisbane at the Gabba, and his three goal, 25-disposal effort on the Queen’s Birthday. Johnson’s season came to an abrupt end in round 20 when he was suspended for six weeks for charging Melbourne defender Daniel Bell. Johnson later admitted his regret, saying he cried in the rooms after the match. As a result, Johnson missed the entire finals series, and the first round of 2008. Bounced back from an underwhelming 2005 to have the best season of his career. Didn’t miss a game, finished equal second in the Copeland Trophy and had career-best numbers across the board. Averaged 23.1 disposals, 2.8 tackles, 6.1 marks and 5.0 inside 50s, as well as kicking 10 goals. His start to the season was particularly impressive, as gathered between 22 and 31 disposals in the opening five rounds, as well as eight Brownlow votes. The crowning glory came on Anzac Day in round four, when he won the Anzac Day Medal. To the amusement of his teammates, he was called ‘Craig Johnson’ by the Anzac veteran who announced him as the winner. Found himself in hot water before round 18 when he and teammate Chris Tarrant were caught up in an altercation in Port Melbourne. Johnson’s hot form continued for the duration of the season, and he lifted again in the final month of the season to ensure the Magpies reached the finals. He was one of the better performed players in the elimination final loss to the Bulldogs with 25 disposals. Started off the season in great form, winning 34 possessions in the loss to the Crows in round two and taking ownership of a more traditional midfielder’s role. Was struck by a nagging thigh injury mid-season and when he returned in round 14 his influence was nowhere near its usual level. Omitted after round 17 and spent the final month at Williamstown. In a year where several senior players were beset by injury, Johnson stepped up as a team leader. Didn’t miss a game for the second year running, averaging 17.2 disposals and 3.2 inside 50s. He led the Copeland Trophy voting for much of the year, and was eventually equal second to James Clement. The team struggled on field, but it didn’t affect Johnson’s ability to catch the umpires’ eyes. He received 12 Brownlow votes, with two best on ground’s against the Kangaroos in round 10 and the Western Bulldogs in round 17. Took his game to the next level. Played in all 25 games and stood up in all three finals. His role in the team’s success only became evident in the public eye later in the year as his confidence grew. Although not a noted goal kicker at that stage, he kicked an important goal minutes before half time in the qualifying final against the Lions from outside 50m, and set the side alight in the preliminary final on the run, again from long range. Was not disgraced in the Grand Final, laying five tackles and showed some resistance to the Brisbane onslaught. Began the year in the seniors but was omitted after the disastrous loss to Carlton in round three. Was an emergency for the next two weeks but was given a reprieve against St Kilda in round six and did not look back. He had 23 possessions and a Brownlow vote in the 83 point win over the Saints and backed it up the following week against the Bulldogs when he was rewarded for his 16 disposals with two Brownlow votes. By now, Johnson was beginning to create a name for himself with his daring run from half back and ability to weave his way out of trouble to turn onto his left boot. His kicking itself has always been a topic of debate due to its unconventional style, but by 2002, Johnson’s effectiveness by foot was as high as anyone’s. Regularly clocking 15 or more possessions a match, Johnson was one of the side’s best in the loss to Geelong in round 15 and headed into the finals series in strong form. Only two quarters in the qualifying final against Port Adelaide, that form, and his confidence, had been shot to pieces. Peter Burgoyne made him look second rate, and a soft free kick for a shove on his opponent in the second term meant Port stayed in touch on the scoreboard. Everything changed with less than 10 minutes remaining when the game was poised to go either way. Burgoyne took a diving mark in front of Johnson at the top of the goal square, and turned around to play on and casually goal. Johnson stayed alert to the danger and threw himself at his opponent, dragging him to ground, preventing him from scoring and potentially saving Collingwood from defeat. His role in the remaining finals was important, with his ability to tag and still create run enshrining him as an important cog in the side. He was rewarded for his improvement with sixth place in the 2002 Copeland Trophy. 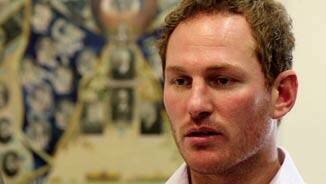 Was honoured in the pre-season when retiring legend Gavin Brown offered him his revered No 26 jumper. Started the year in solid fashion, rarely winning high possession numbers but contributing in most matches. Suspended for charging Geelong’s Mitchell White in round 14 and only played twice more for the remainder of the season, meaning 2002 loomed as an important year in determining his future at Victoria Park. Debuted alongside Josh Fraser, Leon Davis and Damien Adkins in Mick Malthouse’s first game as coach in round one against Hawthorn. Wearing the No 31, Johnson kicked three goals in the 35 degree conditions as the Magpies won by 54 points. Fell away in the next three weeks and was dropped. Bounced back in round 15 against St Kilda with his most complete game for the year, winning a season-high 24 disposals and receiving his first Brownlow vote. Played each of the remaining seven games and began to look more at home in the back pocket with occasional stints in attack. Played for the Preston Knights in the TAC Cup U18s. Won the Knights’ Best and Fairest and was named in the All-Australian U18 team, having represented Vic Metro. Drafted to Collingwood with pick 62 in the National Draft. Formerly from St Mary’s in Melbourne’s northern suburbs, Johnson is one of the few true Collingwood born and bred players of the modern era. His father played for the club’s reserves team in the 1960s, and he grew up supporting the Magpies, naming Gavin Brown as his hero. Had played reserves for Carlton and Richmond as a top-up player during the season.